Learn Cape Cod Wreck Diving from the guy who wrote the book on it! The most talked about dive workshop of the year is going to leave you… completly breathless! Cape Cod offers some of the most unparalleled wreck diving in the USA. Over 2000 ships are known to have met their demise on or around Cape Cod in the last 300 years. Your instructor for the workshop is PADI Master Instructor, Donald Ferris. Don is the authoratative voice in Cape Cod diving having authored three books on diving including, Beneath the Waters of Cape Cod, Beneath the Waters of Massachusetts Bay, and Exploring the Waters of Cape Cod and the Anthology of Cape Cod Shipwrecks. This class is definetley water orientated with the emphasis on diving as many different wreck sites as we can in a short period of time. We’re going to be diving shallow as well as deep, but the overall concept is to develop the proper skills necessary to enable you to dive shipwrecks anywhere in the world with safety and confidence. Here’s the way the workshop is organized: On Friday night you’ll be learning wreck diving knowledge that you will utilize your entire diving career. We’ll show you how and where to obtain shipwreck information and photos. We’ll demonstrate how to minimize the dangers associated with overhead environment diving and discuss practical problem solving and previsualization as a group. Don’t worry about a written test, there isn’t one. We want you learning, not memorizing. Saturday we’ll head out to Monomoy Island or possibly Martha’s Vineyard. 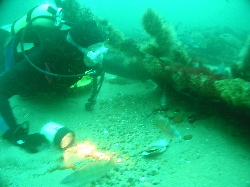 You and your fellow divers will be actually “hooking” the wrecks and securing the boat for diving. On the way, you’ll get to interact with the dive boat captain and learn how to use the GPS, and depth sounders to locate and find wreck sites. Once underwater you’ll be practicing new skills like wreck penetration, air and problem management and you’ll be navigating and mapping out wreck sites like a pro… we promise! The next day we’ll board the boat and head out to some truly virgin wreck sites. You’ll be among a handful of divers to ever explore these nautical time capsules. If conditions are right we’ll also be doing some exploratory dives. You know, looking for new sites! This will include quick submersions to check potential targets, drift diving, or even using tow sleds. By the time the weekend is through, you’ll have four to eight wreck dives under your belt and lots of new experiences. If you’re lucky you might find an artifact or two and maybe a lobster dinner to go with it. C’mon, think about it. 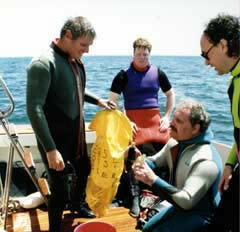 Do you really want to take a class from somebody who read a book on wreck diving off Cape Cod? Or do you want to take a class from the guy who wrote it? I think we both know the answer. Sign up now while you still can! Price: $550 per student. includes . . .